Connectivity management enables data calls to be made to devices. Devices generate data, which is the fuel that powers the IoT, but the value of that data depends on what you do with it and that is determined by the application. Therefore while it is clearly important to develop the optimum applications for specific IoT solutions, that objective of the exercise should be clearly defined and the different ways that it could be realised have to be considered with equal care. For example, data analytics may not be required in the near term. However, as outlined in Decembers article “Data management and data analytics: a synergistic relationship”, this is a very significant development. Artificial Intelligence is another area that should be considered. AI will not only impact on the way that applications function, but it is also changing the way they are developed. Analytics and AI may not be required right now, but the IoT platform you implement should have the requisite flexibility, i.e. be able to incorporate them and other developments in future. Programmers with experience developing IT applications do not need detailed knowledge of the OT (operational technology) in order to create IoT applications. Help is at hand in various forms. 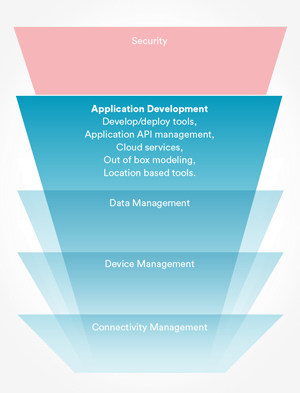 The IoT platforms will typically include: development and deployment tools; application API management; cloud services; and location-based development tools. Development tools and other programming resources are also available from third-party vendors. For example, PTC’s ThingWorx platform has the functionality, flexibility and agility needed to develop and deploy IoT applications. Employing a packaged solution from a reputable vendor designed for specific sectors can be an attractive option. They should be ready to use, be certified, and ideally be based on the cloud-centric platform of a reputable third-party. This approach is ideal for proof of concept projects. One vendor is marketing a solution for over twenty sectors, the relevant cloud service is identified, prices are between € 3 and 5k, a figure that includes two hours of technical consultancy. There is a lot to like about this approach. Independent software development companies can tailor solutions to meet specific business needs and extend them as and when additional functionality is required. One company indicates that one to three weeks are needed for applications development followed by four to six weeks to implement a pilot project using the customised application. Unlocking the value of the physical-digital convergence of the IoT is a big ask. It involves a large portfolio of technologies, services and applications that are constantly evolving. And when the solution needs to operate globally and in a large ecosystem, many if not most businesses will want to focus on their core competence and partner with a major league company, e.g. Azure, IBM Watson and AWS.